We offer leagues year round for soccer and additional sports listed below. Be sure to scroll down to see all league programs currently offered. All sports have been enabled for online registration and fee payment using a credit card. If you have a team that would like to participate in any of our leagues we encourage you to sign up or contact us immediately with any questions. Space is also available for your own league or program...just contact us for details. Please note that all coaches need to have created an online waiver and verified their online rosters. See instructions below. Click Here to create online waiver or roster child. Fore Kicks also strictly enforces Zero Tolerance Policy which all coaches must understand and agree to before entering a team in our leagues. Have questions or need further help with online waivers or rosters? ForeKicks Adult Flag Football League offers several Mens divisions. Play on our large state of the art unboarded synthetic grass fields. Detailed Info & Registration | Need More Info? Play outdoor 9v9 soccer indoors! Our New 9v9 league games will be played on our 52yd wide by 68yd long synthetic grass indoor field to enhance greater offensive and defensive pressure great for tactical devlopment and faster decision making. Year round adult basketball leagues are being offered on our FOUR olympic quality Taraflex surfaced courts with professional tempered glass retractable backboards, adjustable height breakwaway rims, bleachers, player benches, and scoreboards w/shot clocks. Courts are also available for training and open play rental when not being used for league play. Please click on the detailed info and registration button below for more information on leagues and sign-up information. Youth basketball leagues for middle and high school players are now being offered. Play on our FOUR olympic quality Taraflex surfaced courts with professional tempered glass retractable backboards, adjustable height breakwaway rims, bleachers, player benches, and scoreboards w/shot clocks. Please click on the detailed info and registration button below for more information on upcoming sessions and sign-up information. 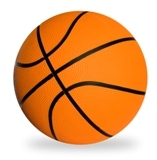 Want to play in our indoor basketball league but you do not have a team? Now you can register as an individual and we will place you on one of our own Fore Kicks Teams for you to play with in our leagues. As part of Fore Kicks commitment to be New Englands premier lacrosse facility, we have the unique capability to offer 3 different state of the art lacrosse field venues including our indoor tempered glass boarded synthetic grass field for box lacrosse, six large 7v7 indoor non boarded synthetic turf fields, plus 4 state of the art outdoor lighted 10v10 synthetic grass fields to service our year round lacrosse programs. Leagues for ages U11 through Adult are offered. Please click on the detailed info and registration button below for current session information and online registration. Middle School, High School and Adult field hockey indoor and outdoor leagues are available depending on the time of year. Our indoor leagues are played on both our synthetic grass, non-boarded fields and our tempered glass non infill synthetic grass boarded arena. Enjoy playing in the comfort of our state of the art 175,000 sq. ft. building with superior LED lighting, air quality and temperature control. We also have four full size outdoor lighted synthetic grass fields for our warmer weather leagues. No team, no problem...see our womens open play pickup leagues for individual field hockey players to enjoy. Featuring a large tempered glass boarded turf field, and 6 large synthetic turf non boarded indoor fields, plus 4 fully lighted outdoor turf fields, soccer is one of our most popular programs. We offer indoor (and outdoor) leagues ranging from U8 to U19, Mens, Womens and Coed Adult age levels. Recreational, travel and premier levels available. Games can be played on both boarded and non boarded fields synthetic grass fields. Schedules and online scores will be posted online and updated regularly for coaches and players convenience. Play outdoor 11v11 soccer indoors! Our New 11v11 league games will be played on our 52yd wide by 68yd long synthetic grass indoor field to enhance greater offensive and defensive pressure great for tactical devlopment and faster decision making. Fore Kicks is pleased to offer our Macro Soccer League which is designed for second grade boys and girls (8 year olds) to serve as a transition step from the Micro 4v4 format to the larger 6v6 format. A goalie position is introduced but still limits the number of field players to four so that they can have more touches on the ball. This league is for U8 teams only. Play will be on our special taraflex courts designed for this format. Please click on detailed info and registration button below for more information and sign up. 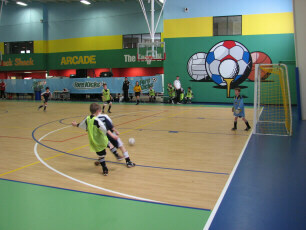 Fore Kicks 5v5 fast footwork futsal league is played on our four professional Taraflex surface futsal fields. This league is played in a 5v5 format with futsal referees and futsal soccer rules on an lined field area 60x90 on a futsal approved surface with futsal sized nets and a lower bounce futsal ball. Our professional Taraflex surface is used in international indoor soccer and futsal competitions and are the only futsal courts of their kind in the New England area.Â This league offers an excellent opportunity for a very fast game with no boards that demands a lot from players, young and old, and can greatly enhance individual player development. As with all of our leagues, convenient online registration and payments, onlineÂ schedules, and online scores and standings will be maintained and posted daily by Fore Kicks. Want to play in our 6v6 indoor soccer leagues but you do not have a team? Now you can register as an individual and we will place you on one of our own Fore Kicks Teams for you to play with in our leagues. Want to just play soccer, or basketball some evening without joining a team? Now you can at Fore Kicks! Open play nights for basketball and soccer are available on select nights for high school and adult players. Click here for additional information. Play soccer on our state of the art outdoor fully lighted synthetic turf fields 110ydsx65yds. Adult, coed and youth age levels available. 11v11, 8v8 and 6v6 formats are available. See specific league session description for full details. 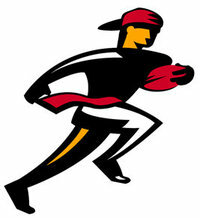 ForeKicks Flag Football League offers Boys, Coed and Mens divisions. Play on our large state of the art unboarded synthetic grass fields 90 ft. by 180 ft in our all weather state of the art facility.